Observation - Who's this? - UK and Ireland. 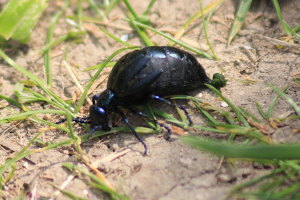 Description: We saw this critter, ~2cms long, on the coastal path approaching Branscombe, Devon. Flicked through my insects book but no luck yet. Any ideas, if the photo is any good? We saw this critter, ~2cms long, on the coastal path approaching Branscombe, Devon. Flicked through my insects book but no luck yet. Any ideas, if the photo is any good?